Mowers made and marketed by Ransomes Jacobsen in Ipswich, UK are once again being used at football stadia hosting UEFA’s European Championship in France. The Stade Geoffory-Guichard in Saint-Etienne, hosted three group matches featuring Portugal v Iceland, Czech Republic v Croatia and England v Slovakia along with the Round of 16 match between Switzerland and Poland. It is maintained using two Ransomes Mastiff heavy duty walk-behind mowers and a Jacobsen Tri-King ride-on triple mower. 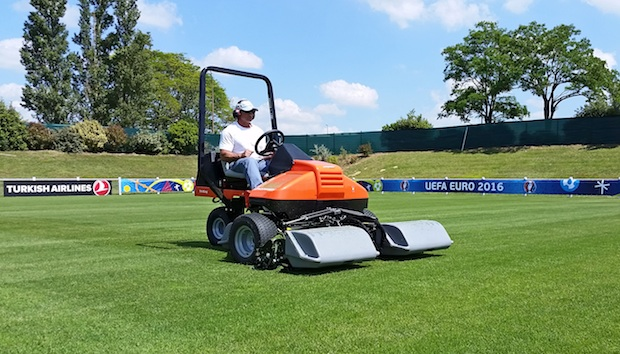 The German squad, based at Evian-les-Bains close to the border with Switzerland, is using the facilities at the Stade d’Evian, which is maintained with a Jacobsen TR3 ride-on triple mower. The players, management and support staff are staying at The Royal Hotel in the Evian Resort, which is home to the LPGA Evian Championship. The golf course and hotel lawns at the resort are maintained exclusively with Ransomes Jacobsen equipment. Iceland’s training facility at Complexe Sportif d’Albigny, on the shores of the Lake Annecy includes the Stade d’Annecy Le Vieux, maintained with a Jacobsen Tri-King, while Spain is using the Stade Pech David in Toulouse, which is also mown using a Jacobsen Tri-King. Alan Prickett, Managing Director at Ransomes Jacobsen said. Ransomes Jacobsen is a Textron Inc (NYSE:TXT) company. More information can be found at www.ransomesjacobsen.com.